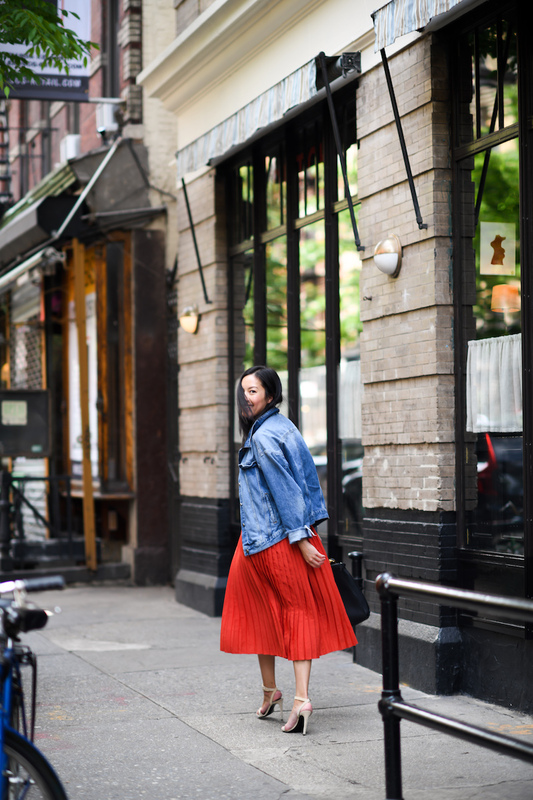 A pop of color for my quick trip to New York and wearing one of my favorite contemporary brands for modern essentials: Vince at Nordstrom. I loved this “paprika” color when I saw it online – it’s a departure from my other pleated bottoms (which are all, unsurprisingly, neutral). My neutrals bring me calm, but this pop of color gives me energy. Perfect for a New York minute. PS: these are actually culottes and not a skirt! Will be grateful on those windy SF days! Sharing more about my trip to NY soon!! Hope you have a wonderful weekend and thank you for stopping by! Love ♥️the look of the jean jacket over the dress! ????? Very nice and elegant outfit with this beautiful red skirt! This red dress is soo pretty! <3 🙂 I love the vibrant pop of red! I’ve been needing a good denim jacket! Thanks for the recommendations.